Michelle Wie is a very popular LPGA player. She really made her name as an amateur and was viewed as the golden girl who would help rejuvenate the struggling brand of women’s golf when she turned pro in 2005 (note: her LPGA Rookie year is 2009.) Fast forward to 2013 and Michelle Wie is still a popular player on the LPGA tour but she has not achieved the “greatness” bestowed on her as an Amateur. In the press this week Michelle Wie spoke about all the hard work she had done during the off-season — working on every part of her game. Unfortunately at the Women’s Australian Open this week Wie missed the cut by 2 strokes or 1-over par. That might not seem bad but it is awful compared to the leader (after two rounds) at 15-under par. So Wie starts her 2013 year where she ended her 2012 season — missing cuts. 2012 really was a horrible year for Wie. She played 23 tournaments and missed the cut 10 times. We could state this in a positive way and say she made the cut (or played the weekend and earned money) 13 out of 23 times (or 56% of the time) but that is still awful. Let’s look at some statistics for the last three years. Michelle Wie has never been a great putter and in 2012 she had no confidence. She would stand over a putt for an eternity and still miss it. Wie has always been long off the tee (she is ranked 4 in overall driving distance) but being long does not matter when you look at Wie’s greens in regulation (GIR) and driving accuracy statistics which are poor. In general, the statistics I have looked at indicate that many of the top players have GIRs between 72% and 76%. The top players also have putting averages below 30 (the really great putter’s have averages between 25 to 27). Let’s look at Wei’s statistics against two other American stars. One last comparison (for fun) — Michelle Wie was in the LPGA rookie class of 2009. Another member of the 2009 class, Jiyai Shin. Shin won the Women’s Australian Open this week beating Yani Tseng (#1 Ranked women golfer in the world) and Lydia Ko (#1 ranked amateur golfer in the world). Shin is also the current RICOH Women’s British Open Champion. In 2012, Shin played 18 LPGA tournaments and made the cut in all 18 events. 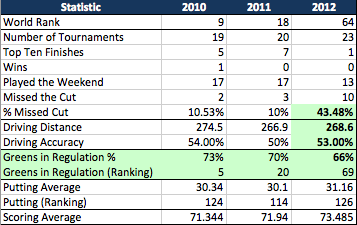 In 2010, Shin was the #1 player in the world rankings for 16 weeks. Shin is a serious contender in 2013. Will Michelle Wie ever achieve the success of, Jiyai Shin, her LPGA rookie year classmate? Will Wei regain some of the glory of her amateur career? Will she find the success so many people expected of her since turning pro? Only time will tell but it crossed my mind today that maybe time is running out for Wie to achieve “greatness.” Given Wie is only 23 years old that might seem like a ridiculous statement but the LPGA is full of young talented players so it is easy to jump to the conclusion that Wie may have missed her time to dominate. My hope for Wie is that she finds her game soon.